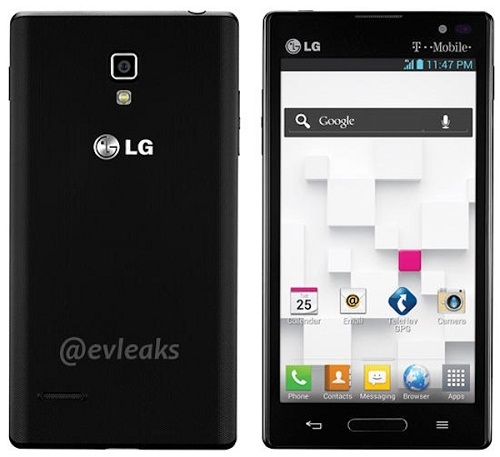 The recent leak defining the arrival of LG Optimus L9 for T-Mobile has been seen at twitter leaks. This device is expected to be a downgraded version of LG Optimus G. This device was officially announced by LG in August 2012 with a dual-core channel. Display: This device comprises a smart LCD IPS capacitive touchscreen with a screen resolution of 540×960 pixels showing a 4.7 inch display. Memory: This device has a 4GB internal memory with 1GB RAM. The device has an additional micro-SD card slot expansion upto 32GB. Camera: This device has a smart camera of 5 megapixels with autofocus and an integrated LED flash. CPU: LG Optimus L9 is powered by a Dual-core 1GHz processor for multi-tasking features accompanied by graphical performance. Operating System: The device supports Android 4.0 Ice cream sandwich upgradable to 4.1 Jelly Bean that has an all new graphical user interface. Some crucial questions can be asked regarding the official launch by T-Mobile. Secondly the device may also be enquired for the expected cost terms. Another question arises that whether this device needs to be bought or not? All these questions have an answer of comparison of this device with the other models in its segment. First comparison comes with the LG Optimus G that has a 4.5 inch HD display powered by quad-core 1.5GHz Snap dragon processor. Along with this quad-core processor LG Optimus G has a 320 Adreno GPU for smart graphical performance. LG Optimus G also favors a rear 13megapixel camera and front 1.3 mega pixel cameras that favors a smart picture quality and enhanced video recording. On the other hand LG Optimus L9 has a 1GHz processor and a less resolution capacity as compared to Optimus G. Camera of Optimus G is much enhanced than that of LG Optimus L9. Second comparison is with Samsung Galaxy S3 that was launched 4 months earlier that has a quad-core processor, a smart HD display and a large screen size for better enhanced graphical performance. On the other hand LG Optimus L9 does not have a competing configuration as that of Galaxy S3. The Jelly Bean update has arrived for Samsung galaxy S3 that has an all new UI but LG Optimus has still not got an update for Jelly Bean. Last but not the least comparison with HTC One series devices that have an all new HTC Sense 4.1 as in case of HTC One X. HTC One X has a smart screen resolution with all new graphical user interface and smart processor of quad core family. The camera of HTC One X is much better as compared to that of LG Optimus L9. One more disadvantage of this Optimus L9 over HTC One X is the graphical performance as HTC One X has Nvidia Tegra 3 processor for smart graphical performance while LG Optimus L9 has no additional GPU. Quality as well as quantity of features makes a complete android device. LG Optimus L9 for T-mobile is rumored to be a complete package. Competition has made LG Optimus L9 low in its publicity. Well these are all special leaks about T-mobile LG Optimus L9. Stay tuned for official announcement.